Dizziness in older people is associated with disability and reduced quality of life. Few studies have investigated how daily life is affected from the older person’s perspective. Identifying barriers and resources in daily life could guide health care in how to direct efficient interventions. The aim of this study was to explore older persons’ experiences of living with chronic dizziness. In this qualitative study seven women aged 74–84 years and six men aged 73–87 years with chronic dizziness (≥3 months) recruited from a primary health care centre in 2012 participated in semi-structured interviews. The interviews were analysed by content analysis. Interpretation of the interviews resulted in the overall theme “Fighting for control in an unpredictable life” with two themes. The first theme “Striving towards normality” revealed a struggle in daily life in searching for a cure or improvement and finding a way to maintain ordinary life. This process could result in feelings of resignation or adaption to daily life, and factors that supported living with chronic dizziness were described. The second theme “Having a precarious existence” revealed that daily life included being exposed to threats such as a fear of recurrent attacks or of falling, which resulted in an insecure and inflexible way of life. A feeling that symptoms were not taken seriously was described. The present study showed that older persons with chronic dizziness have needs that are not met by health care. Despite the fact that frequent contact with health care was described, the respondents described barriers in daily life that led to a restricted, inflexible and insecure daily life. Health care should therefore be individually tailored with focus on aspects of daily life, especially safety aspects. Support should also be continued until the older persons with chronic dizziness have developed coping strategies to gain control of their daily life. Suffering from dizziness strongly affects the life situation as it is associated with disability and reduced quality of life, especially in older people [1–5]. Despite this, studies in older people aiming to explore the perception of the daily life situation from the perspective of those affected are sparse. Dizziness is more common among older than younger persons. The prevalence varies across studies depending on study population and study design but a prevalence of 11–54% in older persons (aged 65 + years) has been reported, higher among women and increases with age [2, 6, 7]. Dizziness in older people are often persistent and difficult to treat [4, 8, 9]. In older persons the origin of dizziness may be difficult to establish and it sometimes has multiple causes [9, 10]. Peripheral vestibular disorders with vertigo/dizziness as a primary symptom include benign paroxysmal positional vertigo (BPPV), vestibular neuritis and Ménière’s disease. Dizziness is also common in central neurological and cardiovascular disorders and psychiatric illness [11, 12] and is a common side effect of medication . A frequent and underdiagnosed cause of dizziness in older persons is multisensory dizziness . Multisensory dizziness emerges due to the deterioration of multiple sensory receptor systems that occurs at old age and is established when all other vestibular disorders are excluded [4, 10]. It involves a decline in postural control, which involves interactions of several systems, such as the musculoskeletal and sensory systems, with the purpose of stabilizing and orientating the body’s position in space. Dizziness in older persons is a predictor of disability [8, 14] and falls [8, 15, 16]. It is also associated with functional aspects such as balance impairments , gait disturbances and problems getting outdoors  as well as need of help in personal and instrumental activities of daily living (PADL and IADL) . Associated psychological factors were found to be fear of falling, depression and anxiety [1, 2, 7, 8]. This shows that daily life is affected in many ways, physical as well as psychological, which may lead to limited possibilities to take part in different physical and social activities. The complex aetiology of dizziness in older persons and the fact that dizziness may be a consequence of the aging process itself can lead to misunderstanding of dizziness in older persons as a natural and inevitable state. However, recent research has shown that it is not [7, 17–20]. Dizziness in older persons has, due to its complexity, been described as a geriatric syndrome [4, 9], a multifactorial health condition that occurs when the accumulated effects of impairments in multiple systems render a person vulnerable to situational changes . When no single factor causing dizziness can be identified, treated and cured, a multifactorial strategy to identify contributing factors such as depression and balance and gait impairment, ought to be investigated with the aim of ameliorating the symptoms [1, 4]. Few qualitative studies, especially in older persons, have explored daily life from the perspective of the individual. The experience of living with dizziness might differ between younger and older people because they are at different stages of life and thereby facing different challenges in daily life. Qualitative studies including both younger and older persons with peripheral vestibular disorders , vertigo  or disorders with central, peripheral or somatoform origins  showed that dizziness causes severe limitations in life . They also showed that dizziness exerts effects on multifaceted aspects of functioning and disability . In a study in people aged 65 + years with dizziness , stabilizing the symptoms and preserving mobility seemed to be important priorities. The same study revealed that the respondents were not well informed about possible causes of dizziness. However, that study mainly aimed at identifying expectations and wishes when consulting their general practitioner (GP) in primary health care and did not explore the daily life situation in older people with dizziness. A broader perspective might bring insights into a variety of aspects affecting daily life. This knowledge could provide a deeper understanding of the situation for older people with dizziness and the kind of support they are in need of, useful knowledge when designing health care for this group. The aim of the present study was to explore older person’s experiences of living with chronic dizziness. To gain more insights and increase the depth of understanding of how daily life is affected in older persons with chronic dizziness, a qualitative explorative design with interviews as the data collection method was used . The participants were purposefully chosen from a primary health care centre in a city in the south of Sweden. The purposeful selection in this context was chosen to recruit older persons with persistent dizziness that was difficult to treat, implying that daily life was affected. Efforts were made to include participants with variation in terms of gender, age, duration of dizziness and diagnosis. The inclusion criteria were: aged 65 + years, dizziness of any cause for at least three months, and ability to communicate in Swedish. Seven women aged 74–84 years and six men aged 73–87 years agreed to participate. They had suffered from dizziness for 1.5 and 20 years (median 7.5 years). Five had been diagnosed with Ménière’s disease, six with multisensory deficits, one with vestibular neuritis and one with acoustic neuroma by their GP or Ear, Nose and Throat (ENT) specialist. Most participants described multiple diseases including heart disease, polyneuropathy, asthma, cancer, arthritis, Guillain-Barré, diabetes, osteoporosis or depression. Five were cohabiting and eight lived alone. Four had home-help (cleaning) or help from relatives in instrumental activities of daily life (IADL). None of them had help in personal activities of daily living (PADL). The recruitment procedure started when a physiotherapist made a follow-up call to persons that had received physiotherapy (PT) on account of dizziness. The respondents had been referred for PT by their GP, ENT specialist or by themselves. To minimize the risk that the respondents were in a state of dependency they were not in active PT treatment. At the follow-up call they were informed about the present study and asked whether they were willing to participate. The first author and interviewer (UOM) contacted them by phone, gave them information about the study and explained that they could withdraw at any time without giving any reason. During the phone calls two persons withdrew due to lack of time and one person due to not wanting to record the interview. For the remaining 13 participants an appointment was made for the interview and a letter with written information about the study, the interview and contact information was sent. The interviews were conducted between February and October 2012, 11 at the participants’ homes and two at the primary health care centre, according to the participants’ preferences. At the beginning of the study the first author and last author (JK) conducted one interview together. The last author took part as an observer to support the first author in terms of interview technique and to be able to discuss the interview guide in depth; all other interviews were conducted by the first author. The interviewers had no professional relationship with the participants. To focus on the aspects of living with dizziness a semi-structured interview guide (Appendix A) with some predefined questions and special topics  was developed and tested in two interviews in older people with dizziness (not included in this study) by the first author and was adapted and refined together with the last author. The guide was constructed with four themes: describing dizziness symptoms; the impact on daily life; strategies for managing daily life; and health care and support. The interviews started with the request: “Please tell me how the dizziness started.” and probing questions were added for clarification. The interviews were recorded and transcribed verbatim by the first author. The interviews lasted between 37 and 72 minutes (mean 54 minutes). To ensure confidentiality each respondent were labelled with a number, and the code list was kept in a secure file only available to the research group. Confidentiality was also taken in consideration when presenting the results. A qualitative content analysis was performed according to Graneheim and Lundman . Content analysis may cover manifest or latent levels or a combination of both where the manifest content refers to the visible, obvious components and the latent component refers to an interpretation of the underlying meaning [26, 27]. The analysis covered both manifest and latent levels and the components were labelled as subthemes, themes and overall theme . The analysis was inductive and conducted in several steps (Table 1). All of the authors read the transcribed interviews. To become familiar with the interviews and get a deeper understanding as a whole, UOM listened to and read them several times. The content and general understanding of the text was confirmed by EEH and JK. The units of analysis were then identified and coded by UOM. To increase the credibility of the study, UOM and JK subthemed two interviews independently of each other and discussed the content until consensus was reached. The interviews were then labelled with preliminary themes and at this time all co-authors met and discussed the themes through back and forth movement between the whole and parts of the text  until consensus was reached. All authors participated in the development of the themes and the overall theme. To clarify the results, quotations from the interviews were used and were sometimes carefully edited. Ellipses parentheses (…) indicated removal of irrelevant words or short sentences and square brackets  indicate clarifications by the authors. This study has been performed in accordance with the Declaration of Helsinki . The study was approved by the Regional Ethics Review Board in Lund (approval nos. LU 2010/402 and nos. LU 2011/659). Written consent was obtained from all respondents. Living with chronic dizziness during old age was interpreted as fighting for control in an unpredictable life, which formed the overall theme. This theme constituted two themes; striving towards normality and having a precarious existence. These themes in turn comprised various subthemes (Figure 1): Thematic overview of the results. Thematic ovexrview of the results. Living with dizziness was interpreted as fighting to live a normal life; that is to maintain or regain life the way it used to be before the dizziness started. It was expressed as recurrently trying out different strategies to cure, improve or control the dizziness symptoms. This could also mean holding on to previous activities or a specific and individual “way of life”. Inevitable changes in daily life were interpreted as voluntary or involuntary which strongly affected how living with dizziness was perceived. By getting support their concerns were taken seriously. This theme comprised four subthemes: fumbling for a cure and improvements, a struggle to maintain or regain an ordinary life, movement towards resignation or adaption and a way to relief through confirmation. R: “I’ve developed a number of techniques so I can eliminate a lot of the effects [of dizziness]. The second theme was interpreted as having an insecure daily life in terms of not knowing how the day or the future would turn out. This could mean a fear of getting into dangerous or unpleasant situations such as losing one’s balance when being outdoors, or concerns about being dependent on others in daily activities. It also involved a fear of not receiving the amount of help and support that was needed today or in the future. A lack of support from health care led to feelings of being abandoned and expectations of recovery being dashed. This theme comprised three subthemes: to face constant threats, to be restricted in everyday life, and to get insufficient support. This qualitative study showed that living with chronic dizziness during old age could be interpreted as a fight to take control over one’s life situation when living an unpredictable existence. The fight was described in various ways by all respondents and how much daily life was affected varied. The unpredictability was, however, an aspect that they always had to consider and which strongly affected daily life. The results of this study are in line with other studies giving a multifaceted picture of functioning and underlining how much the pathology of dizziness interferes with daily life [21, 23, 24]. Aspects of living with dizziness have been linked to over 140 International Classification of Functioning, Disability and Health (ICF) categories in bodily functions, activities and participation, as well as environmental factors  and ICF may be used as a way to describe the complex situation of the individual. Striving towards normality was described as a variety of fighting strategies. It was expressed as trying to maintain or regain physical functions or great efforts to continue with certain activities, showing that they were fighting to maintain their previous lifestyle. Some of the respondents had to plan their activities in advance but this strategy was expressed as being very energy consuming and the respondents expressed concerns as to whether or not they would be able to go through with their plans. To stay independent was an important issue, as was shown previously . Self-learned strategies were similarly described in other studies in persons with chronic dizziness [21, 24], indicating that they are fighting on their own to take control of the situation. Earlier studies showed that dizziness is associated with decreased activities in daily living and decreased engagement in social activities [1, 2, 7]. The present study shows that, even after many years with dizziness, elderly sufferers are still fighting to regain the life they used to live before their dizziness started. This was seen in both “Fumbling for a cure and improvements” and “To get insufficient support”. 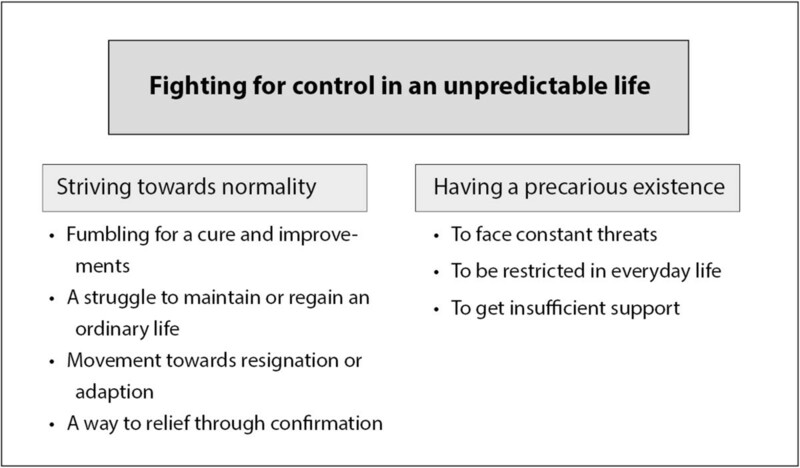 Fighting for control contained a physical dimension in terms of fighting to stay mobile or not fall, but also a psychological dimension in terms of “understanding their disease” or fighting to have their concerns taken seriously or to receive treatment. A wish to find the cause of dizziness was reported previously [21, 24]. Even though the respondents in the present study had diagnoses not all of them knew the cause of their dizziness and this indicates the need to develop information strategies for older people with chronic dizziness. The results reveal that the respondents needed continuous support. Even though the respondents had been diagnosed and medically treated, they still strived to be cured or improved. To identify and treat underlying potentially life-threatening conditions should always the main priority when examining and treating persons with dizziness [20, 30], but the present study shows that the need for support remains even when there is no cure. Supportive resources that counteracted the negative effects were described. They could include receiving support from family and friends, as was shown previously , but also support in relation to health care. Successful treatments and quick access to health care were, as expected, expressed as moderating factors. However, in addition, it was also important that one’s concerns were taken seriously, that there were somewhere to turn and that one was supported and encouraged to cope living with dizziness. This indicates that treatment should not end until the older person with dizziness has developed the ability and self-efficacy  to control their daily life situation. Dizziness in older persons is associated with balance impairment, fear of falling, falls and fall-related injuries [2, 8, 32–35] and also forms of emotional vulnerability such as exhaustion and insecurity [21–23]. In the present study it clearly emerged that these are all aspects that may cause unpredictability in daily life. Internally the fear was manifested as a feeling of not being able to trust and control the body and externally it was manifested as environmental barriers, a fear of getting into dangerous situations or a lack of support. Due to those fears a majority of the respondents were not able to live life the way they wanted to and avoided making plans for the future, which made their daily lives strongly restricted, inflexible and insecure. This article explored daily life in older people with chronic dizziness, but threats to control have been described in people suffering from other diagnoses such as Parkinson’s disease and diabetes [36, 37]. However, managing threats in daily life in old age may require consideration of individual and contextual factors, and not merely the diagnosis . Health care professionals should understand the significance of control and threats to control in an older persons’ life, and give individual support , that goes beyond merely treating a specific diagnosis. To focus on safety aspects of daily life could be one way to increase control. Our results clearly indicate that health care has not managed to meet the respondents’ needs. Some of the respondents showed a strong will and motivation to fight to take control of their situation. Others felt resigned with no hope of recovery and lacked the ability and confidence to manage and control their situation. They all expressed difficulties in managing daily life. It is therefore important for health care personnel to pay attention to the state and specific requirements of the affected person to be able to tailor treatment. Like other studies [4, 9], the present study emphasized that in chronic conditions interventions that influence daily life situations is more desirable than merely receiving a diagnosis-specific treatment. Elderly people with dizziness need support to be able to solve everyday situations and to adapt to a new life situation. For some respondents this could include solving practical issues or support to stay active and independent. Others who expressed feelings of resignation and not being in control of their situation might be in need of other treatment methods. Combining physical and psychological therapies in older patients with dizziness has shown positive results . The qualitative design of the present study implies that trustworthiness in term of credibility, transferability, confirmability and dependability has to be taken in consideration [27, 40]. Credibility refers to the truth and believability of the data and was enhanced through variation in gender, age and cause and duration of dizziness. Even though the age variation might be considered quite small, the variation in duration of dizziness and cause of dizziness increased credibility. The study included 13 respondents and sampling was continued until saturation, i.e. no further information was obtained. Credibility was enhanced by triangulation i.e. the researchers involved in this study had different professional backgrounds, all with experience of working with older persons in different health care settings and some with further education in vestibular disorders. Credibility was also enhanced by the transparent description of the analytic process (Table 1). To ensure dependability i.e. the stability of data, a thematic interview guide (Appendix A) covering different topics with the same open initial question was used to ensure that the interviews covered the same areas. Confirmability refers to the objectivity of the researcher and the data analysis and was enhanced through researcher triangulation and the use of quotations from the respondents’ statements. This study revealed that when managing older people with chronic dizziness in clinical practice it is important to pay attention to the state and specific requirements of the individual to optimize the care. Barriers and resources in daily life must be taken in to consideration. Treatment should not end until the person has developed the ability to control the daily life situation. The care should specifically focus on enhancing safety aspects in daily life. This study also highlights the need to improve how information is communicated to older people with dizziness. This study showed that even though the respondents in this study had been diagnosed and medically treated, they still strived for a cure or improvements. This implies that health care for older people with dizziness do not cover their needs. To maintain their previous lifestyle and stay independent was considered important. Enhancing safety and control in daily life should be prioritized. The support for older persons with chronic dizziness should therefore be individually tailored and not end until they have developed coping strategies to control their daily life. Please tell me how the dizziness started. Please tell me how it is living with dizziness today. Can you describe your dizziness without using the word dizziness? How is everyday life affected by your dizziness symptoms? How was your life situation before and dizziness started? And now? What would your life be like today without dizziness? Please tell me about a dizziness episode. What happened? What did you do then? Do you think your future life will be affected by the dizziness? How? We especially thank the respondents in this study for sharing their experiences of living with chronic dizziness. Original funding was provided by the Centre for Primary Health Care Research, Department of Clinical Sciences in Malmö, Lund University, Sweden. We thank Stephen Gilliver who provided editing services on the behalf of the Center for Primary Health Care Research. UOM was responsible for the study design, acquisition and analysis of data and drafting the manuscript. JK substantially contributed to the study design, acquisition and analysis of data and drafting the manuscript. EEH contributed to the study design, interpretation of data and in drafting the manuscript. CE, PM and UJ contributed to the study design and drafting the manuscript. All authors critically revised the manuscript and approved the final version to be published.